Last week, rising tension between North Korea and the U.S. rattled the world's markets. As the two countries traded tough words, concerns escalated and markets reacted emotionally to the news. Though stress is building internationally, we remain committed to focusing on the market fundamentals that drive long-term value. In the coming days, we will publish a white paper outlining the details of how markets have reacted to other significant geopolitical events. History shows that markets can fall in the wake of alarming news but do recover, given time. We encourage you to stay tuned for the white paper and talk to us if you have questions or concerns. 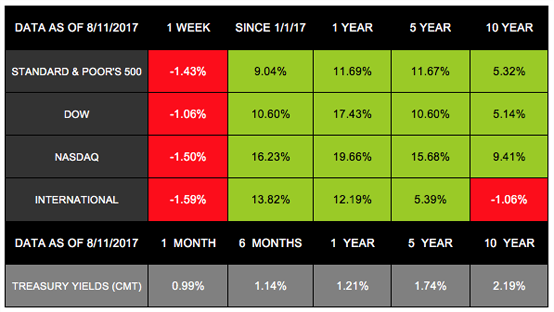 Amidst the pressure last week, volatility returned to markets - and all three major U.S. market indexes turned south. The Dow dropped 1.06%, the S&P 500 fell 1.43%, and the NASDAQ declined 1.50%. Global markets also reacted as the MSCI EAFE lost 1.59% for the week. Impressive Corporate Earnings: Q2 corporate earnings reports both domestically and internationally were impressive. Reported corporate earnings in the U.S. increased an average of over 10% for the second quarter in a row - their first time doing so since 2011. Low Inflation: The consumer price index, which measures changes to the average price of specific goods and services, rose only 0.1% in July. Expectations for a 0.2% increase failed to materialize as housing and travel costs, wireless services, and auto sales all slumped in July. At 1.7%, year-over-year inflation remains below the Federal Reserve's targeted 2% growth rate. Continued low inflation may cause the Fed to rethink its plans to raise interest rates. Rising Demand for Labor: Labor markets continue to be a key economic driver as evidenced by sharply rising job openings. June's job openings jumped to 6.2 million from 5.7 million in May. Year-over-year, job openings climbed an impressive 11.3%. Moreover, jobless claims remain at historic lows. High U.S. Household Debt: The current outstanding consumer debt of $12.7 trillion is now higher than the previous record reached in 2008. This debt load could wind up being a drag on consumer spending and the economy as a whole. Tense geopolitical headlines may continue, but there will be plenty of market news, too. Retail, manufacturing, and housing data will come out this week, and Friday's August consumer sentiment numbers will be of interest. Though the markets may move with emotions, economic fundamentals should continue to be the base for long-term value. No matter what questions you may have, we always welcome you to reach out and contact us. We are here to help.